If you have a toddler over the age of 1, the thought of having any sort of photo session with them might be the most horrifying thought ever! The little toads rarely sit still, and getting a smile out of them is going to be impossible, right? No, not if we head outside. If your little one is anything like mine, playing outside in puddles, kicking leaves, swinging on swings, and running faster than their legs can carry them makes for so much more fun than standing in a studio being made to sit still and behave! And why wait until the summer, as long as you’re wrapped up warm, outdoor shoots can be wonderful all year round, from the snowy days of January (and March as I’m typing this), the beautiful spring days and bluebells, and the golden and amber colours of the autumn leaves, there are so many amazing (and fun) backdrops that this country gives us! And believe me, kids love it whatever the weather. And this is where they come into their own, capturing the kids playing means we get natural smiles, not fake ones. We can run and play chase, we can play hide and seek, and I’ve also been known to puddle jump too! 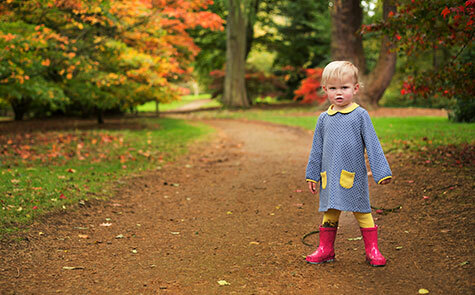 I run outdoor family sessions all year round, in some of the most stunning locations in Oxfordshire, so why wait! Be prepared. Kids get bored and hungry very quickly. Bring along plenty of snacks and drinks to keep them fed and hydrated in between the fun! Think about clothing. Whatever the weather, think about coordinating your clothing. This doesn’t mean you all wear the same outfit, far from it. Pick clothes that reflect the season and the colours, and try and reflect similar tones in everyone’s outfit. Don’t stress. Unless you have an unusual one, kids don’t play ball when you want them to. This is why we take our time. We play. We have fun. We use props. And fingers crossed, we capture the magic in between. Discuss a time that works for you. Photographing kids can be tricky, so pick times that work for them. Think about when they are at their best and you’re likely to get the most out of them.